Police cordon off Zuccotti Park, take down camp, keep out press (but MoJo reporter Josh Harkinson makes it in). 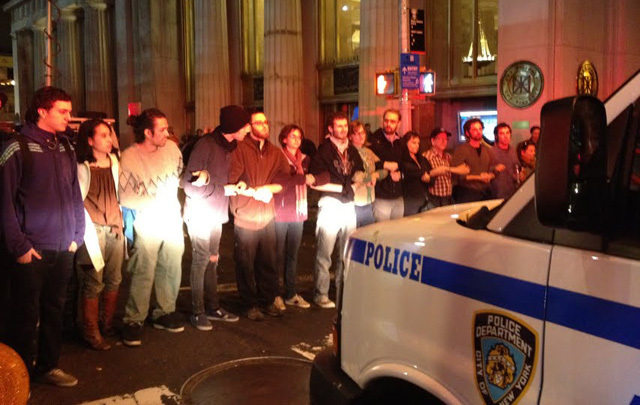 Read Josh’s first-hand account of the raid and check out all the rest of our #OWS coverage. Monday night’s police action at Zuccotti Park took place under something of a media blackout—no reporters were allowed near the scene. MoJo’s Josh Harkinson and James West were there, and Josh eventually got into the park. Following is a roundup of the night’s events based on Twitter updates from Josh, James, other journalists, and the Occupy livestream.